The Internet has solved many of life’s little headaches. With a couple of swipes of your finger, you can order your groceries to your doorstep, find a doctor who can see you immediately, rent an apartment halfway around the globe or hitch a ride in a stranger’s car. 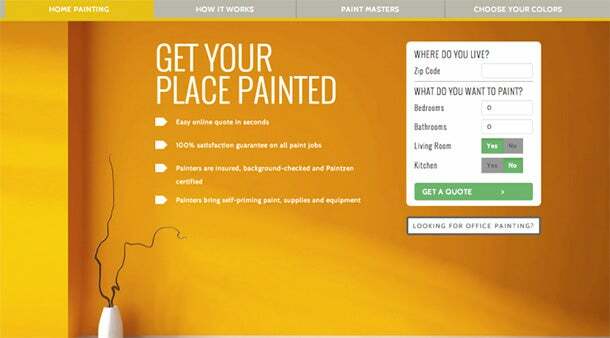 And today, with the official launch of New York City-based PaintZen, you can now order a painter to come to your home or office and paint your walls for you. Rejoice! The service gives people an instant online quote, helps them pick their paint colors and secure any building insurance and then sends a team of qualified painters (with paint, supplies and equipment) on a date and time of the user’s choosing. The idea is to take the hassle of what’s often a daunting process. Sure, you may be able to manage to paint a room yourself. But, first you have to lug paint and painting supplies to your home (no small task for city dwellers who live sans car) and then you have to spend your weekend on a ladder, covered in paint. In many cases, what actually happens is your living room never gets painted. Real-estate mogul and Shark Tank investor Barbara Corcoran agrees. She is one of the investors who participated in PaintZen’s $1.8 million seed round, announced today. The company, which painted 4,000 rooms in its testing phase, is launching only in New York City and San Francisco, though CEO and co-founder Michael Russell wants to eventually expand the service nationally. In an age when you can order a manicurist to come to you with the click of a button and give you a fresh pedicure, it’s about time there is a way to order a paint job for your bedroom.